Trick or Treat, or Rattlesnake? Halloween caution for Arizona neighborhoods, and FREE rattlesnake removal Halloween night. Throughout most of the desert areas of Arizona, rattlesnakes are quite busy in late October. They’re finishing up activity for the year–getting a last meal, some are mating, and all of them are on the move to wherever it is they are looking to spend the winter. They tend to move right at dark and just after, and are “camping” in spots that aren’t necessarily long-term or ideal for rattlesnakes. Contrary to popular belief, in Arizona, rattlesnakes are still quite active well into November. Halloween is no exception. 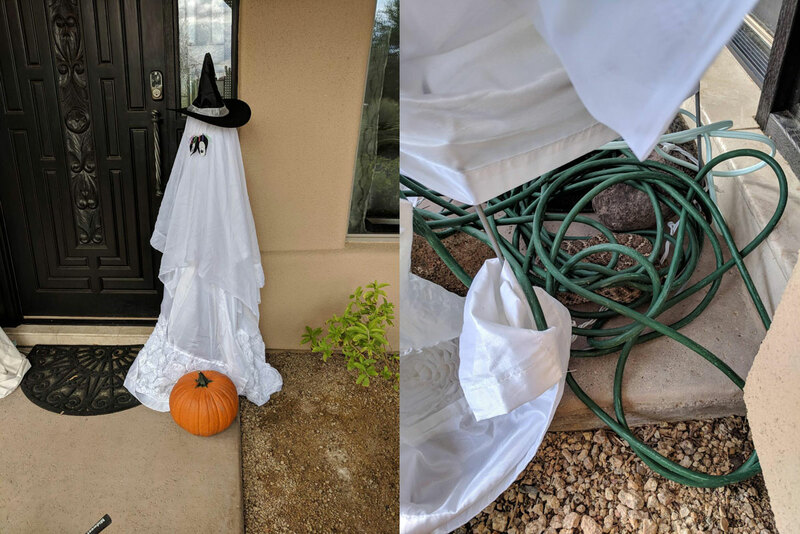 Here’s a Western Diamondback Rattlesnake found hiding in decorations. This just happens to coincide with an evening when every child in the country is also walking around in the dark, often without full visibility. That means that there is some potential for encounters with rattlesnakes. That doesn’t mean trick-or-treaters should stay home or be overly concerned, of course, just take some precautions and stay aware, just like anything else you do in our urban rattlesnake habitat. That goes not only for the kids, but homeowners who have decorations set up. Everyone have a flashlight! Rattlesnakes are not aggressive, but may defend themselves if stepped on. Don’t cut through yards, use the path to the front door. Make sure you can see the ground clearly through any mask that may be worn. Don’t pick up or play with toys or Halloween decorations that resemble snakes! Stay on sidewalks and avoid brushy or debris-filled areas. Be especially cautious in areas within 1/4 mile of new development. When cleaning up decorations, be aware that rattlesnakes could be using them for cover. Look before you reach. If you have pumpkins out, place them outside of the entryway overhang, and avoid creating a protected space in corners. Clean up pumpkin remnants immediately, the next morning, to avoid attracting rodents. Make sure any debris is cleaned up and landscaping is taken care of several days before Halloween. Store Halloween decorations in a plastic box or other container, rather than cardboard or in the garage corner. Rattlesnake Solutions is offering FREE rattlesnake removal in the Phoenix-Metro area on Halloween night for any snake in a public area. Keep an eye on the snake from a safe distance. Prevent anyone from going near it, attempting to capture, or kill it.